Ladies "Learn From Yesterday" Necklace Just $3.35 Down From $29.99 At GearXS! Ships FREE! You are here: Home / Great Deals / Ladies “Learn From Yesterday” Necklace Just $3.35 Down From $29.99 At GearXS! Ships FREE! Ladies “Learn From Yesterday” Necklace Just $3.35 Down From $29.99 At GearXS! Ships FREE! 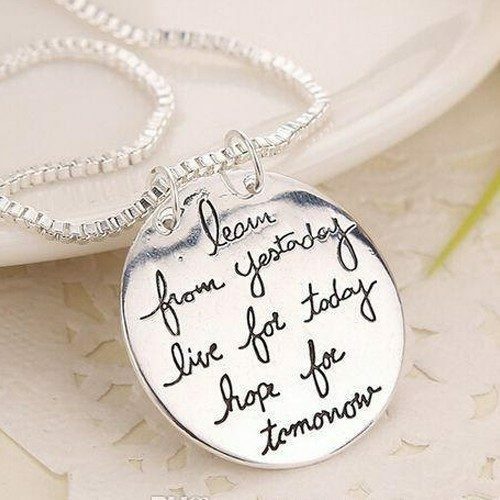 GearXS has this beautiful Ladies “Learn From Yesterday” Necklace Just $3.35 on sale for $3.35 (Reg. $29.99) when you use promo code GSX-16 + FREE shipping! Inspire someone with this beautiful silver-plated pendant necklace. The round pendant is inscribed with the message, Learn from yesterday, live for today, hope for tomorrow, making it the perfect empowering, encouraging, and inspirational gift for anyone on your list. Stunning looking. Order yours today.